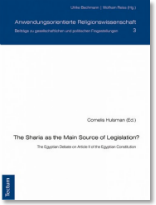 The Sharia as the Main Source of Legislation? Home / The Sharia as the Main Source of Legislation? As Egypt enters a new phase of transition with its first Islamist government, there is a fear regarding the push for implementation of Islamic law through Article II of the Constitution. This book wants to spark a fruitful exchange by offering an unprecedented look into this debate in Egypt. Providing statistical analysis, interviews, as well as contributions by many Egyptian officials it allows readers to develop an informed position on this matter.